Photo Courtesy of the Belize Reporter – Vats of “salted” permit fish sit in barrels. A recent article in a Belizean newspaper based on an investigation by Turneffe Atoll Trust reveals that Belize’s fish stock are being devastated by illegal Guatemalan gill net fishing. 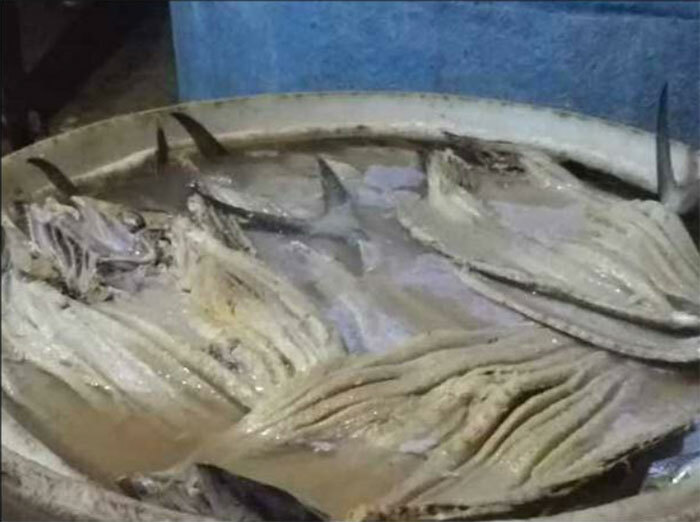 The story, written and published by Belize’s newspaper, The Reporter, photographed large barrels of filleted and salted permit, shark, shark fins and other fish along with conch and shrimp in Guatemalan warehouses headed for Asian and domestic markets. These fish are primarily being caught at night by Guatemalan fishing boats using large gill nets in Belizean waters. Shark fins, however, are the major product, bringing $100 per pound with a large shark producing up to 12 pounds of fins. The harvest of Belizean sharks was well documented by Dr. Rachel Graham in 2007. At that time, Dr. Graham estimated that 26,000 pounds per year of shark fins were being exported from Belizean waters to Guatemala. She noted then that, “Sharks in Belize are scarce where once they were abundant.” Since then, this trade has escalated dramatically and now involved the gillnetting of nearly all fish species in Southern Belize. The netting of the sport fish – primarily permit – jeopardizes Belize’s important tourist industry. “Recent data shows that 35% of our Gross Domestic Product (GPD) comes from tourism, with 60% of tourists participating in marine activities. Without fish, this is all in jeopardy,” the expose concluded.